As our blog followers know, last month I posted an entry entitled “Food To Die For” which was a synopsis of Jessica Bemis Ward’s first cookbook for Lynchburg’s Old City Cemetery. 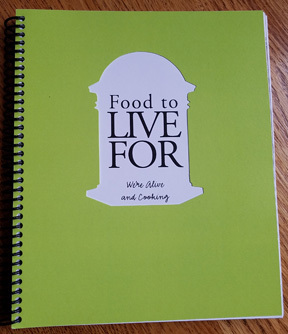 Today I want to expose you to her second book, Food To Live For We’re Alive and Cooking. It took Jessica almost ten years to compile and write her second cookbook. After the huge success of her first she and the wonderful staff and volunteers at Old City Cemetery knew she needed to write a follow-up. Food To Live For concentrates on the foods prepared for gatherings of family and friends, as did Food To Die For. The recipes in Food To Live For celebrate daily meals as well as celebrations, birthdays, holidays, dinner parties and spur of the moment suppers among neighbors and friends. Just reading the table of contents to review the categories of recipes included will make your mouth water. Appetizers, soups and chowders, salads-including main dish salads, main courses and of course desserts. Speaking of desserts, there are six recipes for all things chocolate! As before, sprinkled throughout the book are helpful hints, tips, sayings, musings and wonderful pictures from various members of the Old City Cemetery staff and volunteers. Some of these will make you chuckle. Others will remind you of your mother or grandmother. Others still will prod you into action. The pictures throughout the book add to the stories of the gravegarden, the people who reside there and there lives before. Several pages speak of “cooks in the gravegarden.” Personally I find it interesting to know more about some of the people who are buried at Old City Cemetery. 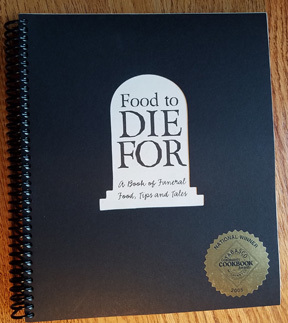 Food To Live For is available for purchase at Old City Cemetery, 401 Taylor Street, Lynchburg, VA 24501. 434.847.1465. www.gravegarden.org. Proceeds from this book also benefit the cemetery and it’s education programs, tours, maintenance and growth. Old City Cemetery is always an interesting place to visit, no matter the month, season or weather. If you haven’t visited this special place yo are long overdue.